Nick and I have decided that we should share with you something the doctors have told us on May 8th. I guess it took us a while to share it with you since it’s a been a bit rough, we’re taking it day by day and another thing is we haven’t really had the time. We are deciding to share it with you because we would like you all to pray with us. Grade 1 – bleeding occurs just in a small area of the ventricles. Grade 2 – bleeding also occurs inside the ventricles. Grade 3 – ventricles are enlarged by the blood. Grade 4 – bleeding into the brain tissues around the ventricles. Grades 1 and 2 are most common, and often there are no further complications. Grades 3 and 4 are the most serious and may result in long-term brain injury to the baby. Hydrocephalus (too much cerebral spinal fluid in the brain) may develop after severe IVH. Unfortunately, our baby boy has the Grade 4 bleed. The docs discovered that he had the bleed on his 1 month head scan check up. It was a routine check up. It wasn’t like they saw something different with Des that they had to check his head right away. The one thing the doc said is that, the bleed happened probably a couple of days after he was born. And it has now turned into cysts in his brain. The good thing is that it’s not swelling (please pray that there won’t ever be). What happens to the cysts in his brain? It will just stay there. There’s no need to remove it, his developing brain will just grow around it. If the same bleed happened to us grown ups, we would be in deep trouble. But for a baby, because it’s developing, it could not have any effect on him at all. What are the possible effects of the bleed? Well the doc said the bleed happened on the right side of his brain which could affect his motor skills on the left side of his body, specifically his left leg. Basically, he is at 50/50 risk of having problems with motor skills, basically, Cerebral Palsy. So we are holding on to the 50% chance that there will be no effects. AT ALL! I know, I know… it’s pretty heavy isn’t it? So here I was on May 8th, holding my baby boy as the doc tells us the news of what happened. He of course, has to lay out everything on the table, the possibilities, the risks and etc. But because he’s a good doctor he said, “I hope you come back to me in a few years and say that everything I said that could happen didn’t happen.” To this I said, “We will come back doc and he’ll even do a choreographed dance to prove you wrong.” And this is the very reason why I’m writing about it now. Because I would like you all to pray with us. To pray that our baby boy grows up running, talking, dancing and cartwheeling like any other boy. There are days of discouragement and encouragement. Especially, when it comes to his feeding. He hasn’t been consistent with his bottle feeding. Sometimes he takes a lot, sometimes he doesn’t want it, and if he doesn’t want it, they have to gavage it. 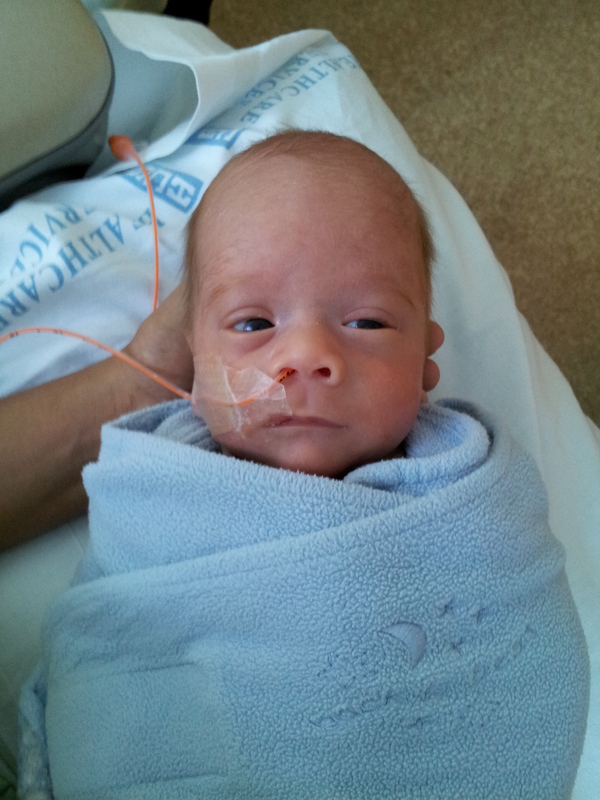 Meaning, feed him through his feeding tube that goes through his nose. So for two days after the conversation with the nurse, Des didn’t nurse much or bottle feed much, and I was discouraged. I was crying out to God, “Lord please… please don’t let this happen.” But Nick kept on pressing on saying, “It’s nothing babe.. it’s nothing.” But after the two days, Des came back with a vengeance and drank 30ml when Nick bottle fed him (he should be drinking 49ml per feed, he was averaging 10ml bottle feeding with the nurses before that), and he nursed well after that too. Yay to that! There are still days that he doesn’t bottle feed that much, there are days that he surprises us. 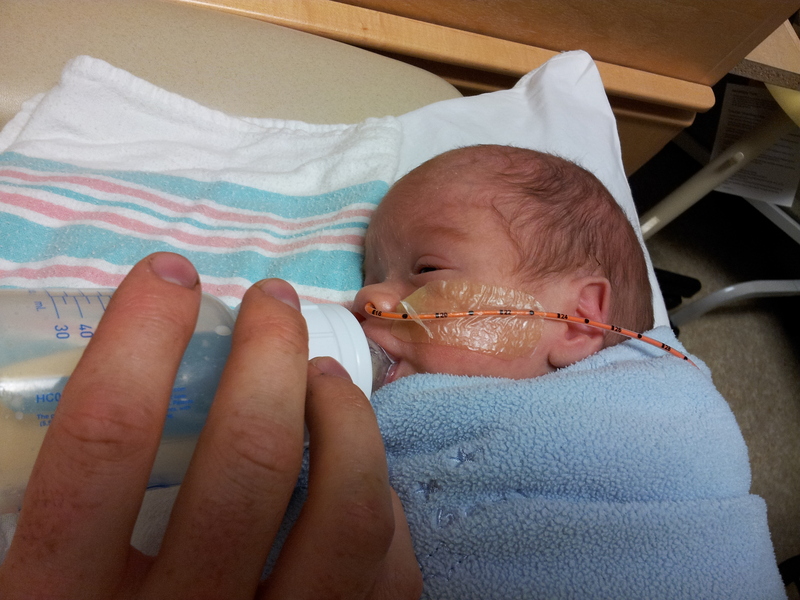 Another reason why the bottle feeding is a big deal is because, once he starts finishing whole bottles per feed a couple of times, he will get to go home soon. (yay good news!) I want to talk about the first meeting we had today with the PT but I’ll save that for tomorrow’s post. 1) Des could come home soon once he starts finishing whole bottles of milk. 2) He is growing rapidly! He is more than twice his birth weight! Carrying him feels like carrying a full term baby. 3) His hearing and eye tests have come in normal. 4) We were blessed with a baby shower so we are getting close to completing everything he needs in the nursery. 5) He is wearing his own clothes now! I have been bringing his clothes to the NICU and he gets to wear it. 6) He has been pooping and tooting like he should. He likes to toot when we carry him. So warning to friends and family when he comes home and you want to carry him. He will toot on you. 7) I have given him two baths already! It was sooo much fun! My little boy enjoyed it like he was in the spa. He did not fuss one bit! Des after the first time I gave him a bath. He was sooo content. He smelled soo good too! 8) There is joy in our lives despite the discouragements in life. 9) Our God is a BIG GOD who is faithful with his promises. Promises of healing, comfort, joy, strength and rest. 10) That there are people praying and supporting us through all this. I want to write more but I have to go and eat, pump, shower and sleep now. I will post some prayer points below though. Pray AGAINST delayed developmental anything over Desmond. That he grows up whole, complete and nothing delayed. That God would completely heal him from IVH. Pray that he would finish his bottles of milk SOON! Pray for Nick and I, for strength, hope, perseverance, joy and rest through this. Pray for my milk production to increase. So much so that I’d have more than what Des needs. Pray for finances, for our insurance to completely cover all the bills. Even Desmond’s therapy. Pray for success in each therapy session. Nick and I will also be helping with Desmond’s therapy. So the PT is not the only one helping Des with the exercises, Nick and I will be doing it too. Pray for God’s miracle to be shown in Desmond’s life. That Desmond’s life be a testimony of God’s greatness and goodness. Thank you everyone for your prayers. Nick and I absolutely appreciate it. We are blessed because you all have been very supportive and encouraging. Thank you Tanya and Nick for sharing, We will continue to pray for you both and Desmond. Hang on to God always. In a short time Des will be playing with Uncle Siggi. Standing with you Nick and Tanya and claiming and expecting a complete work in Desmond’s body. Declaring that he will indeed run, jump, dance the hip hop better than any boy. Declaring that he is a warrior, more than a conqueror. May the peace, joy, and presence of our Lord fill you and surround you and His mighty favor be upon you for all of your prayer points and more. Hooray that He already knows your every need. Tans, I don’t know the right words to say after reading your post. Please know that we share your burden, heartaches, and especially your joys. We will be diligently praying for you and Nick, especially Desmond. Heavenly Father, nothing is impossible with You. Please touch Desmond’s body, we ask that you’d heal him completely and that he’ll grow to be an active, dancing, jumping, running beautiful boy. In Jesus’ name! Hey- with the feeding don’t worry. You know sometimes they eat a lot and sometimes a little. I’ve learned that with eliah. It’s weird and I want to shove food down her throat to make sure she eats enough but they know what they need. That’s a great sign too that he does know when he needs to eat and how much. Forget the nurses and move onto more positive things for Des. You’re his momma and yiu know just what he needs. Be strong and remember God knew this from the beginning of time. Des is a warrior and with the moves his momma has there will be no doubt a little boy shakin what’s he’s got soon enough!. 🙂 I’ve got some PT friends too if you need advice before or after you leave the hospital. Hugs! Thanks everyone for your encouraging words, and standing in faith with us believing that God is 100% willing and able to heal. This will be part of Desmond’s testimony: the docs said one thing, and God made the impossible possible. Our God is Healer, awesome in power! What can stand in the way of the Almighty? How are you my little warrior? I’m your lola or mamu whatever you want to call me. I’m your mama’s mom. The moment i learned that you came out into the world unexpectedly, i wanted so much to go there and see you but because you,re so far away it was impossible to do so..
You’re too excited to meet your mom and dad huh! Make yourself strong and healthy because we have so much to do when you come and visit me. You will meet your lolo and titos and cousins too. You’ll see how beautiful where your mom comes from although our weather is not as cold as it is there since we livein a tropical country.. You will enjoy the sun and the beaches. Do you know that your parents love the beach? Oh yes they do.and i’m sure you will too.So now, show everyone how strong you are, how wrong the doctors are coz you will grow up normal and healthy. I will wait for your visit that i’ll make sure you will have so much fun.